Preheat oven 350°F. Before you get started with the crust, wrap a 9-inch springform pan in a few layers of foil to make sure the pan stays watertight during baking. Be careful not to rip the foil, or water will get into the pan and ruin your cheesecake. Mix crushed graham crackers, 2 tablespoons sugar, 1/2 teaspoon cinnamon and pinch of salt together in a bowl. Add butter and mix with clean fingers until pea-sized crumbs form. Press all of the graham cracker mixture into the prepared springform pan. Tip: To get a flat, even crust surface, press down firmly with the flat bottom of a measuring cup. Bake the crust for 10 minutes on a low oven rack. Remove from the oven, and allow it to cool completely before adding the filling. Turn oven temperature down to 325°F. To make filling, cut cream cheese into pieces and add to a mixing bowl. Whip until smooth, about 4 minutes. Then add 1 1/3 cups sugar, and continue to beat until smooth again, another 4-5 minutes. Next, add vanilla, salt, sour cream and heavy cream; beat until smooth. Add in 1 egg at a time, beating briefly between each egg. Pour coloured mixtures into cooled crust. Start with red filling, and slowly pour it right in the centre of the crust. 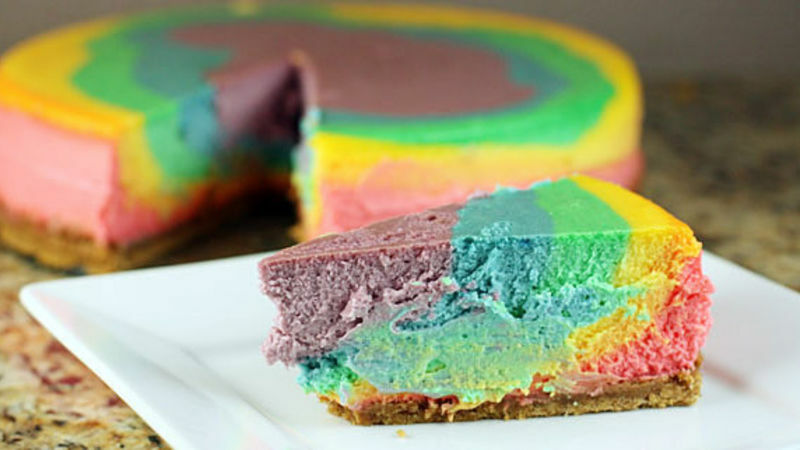 Continue to build the rainbow by pouring the fillings directly in the centre. This will create layers so that each slice has some of each colour. Place cheesecake into a baking dish on oven rack, and fill baking dish with boiling water about 1 inch up the side of the springform pan. Bake at 325°F in the water bath for 1 hour and 40 minutes to 1 hour 50 minutes or until set but still jiggles slightly 2 inches from the edge. If cheesecake begins to brown on top, cover loosely with foil during last 5 minutes of baking. Turn off the oven, open the oven door a crack, and let the cake cool in the oven for 1 hour. Cooling it slowly will help prevent the top of the cake from cracking. Then loosely wrap the dish in foil (so the foil isn't touching the top of the cake) and refrigerate for at least 4 hours before serving. When ready to remove the cake from the pan, run a clean narrow knife along the inside edge to loosen the sides of the cheesecake from the pan. Remove the foil, unlock the spring and carefully lift off the outer ring. Serve alone or with a simple fruit sauce, like cherry or raspberry. Although this cheesecake is so rich and creamy that it really doesn't need a topping.